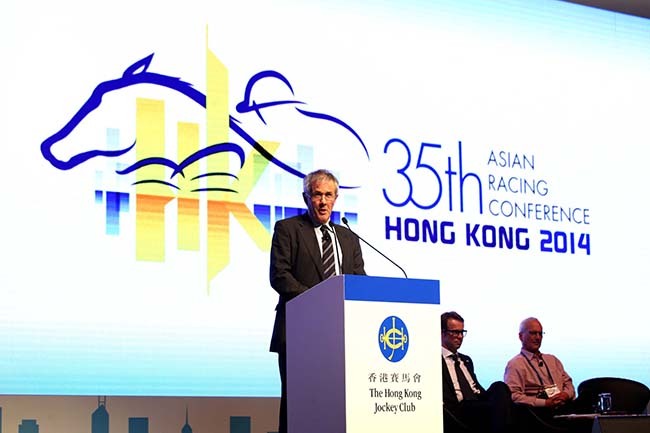 Bill Barich, lead writer for the HBO racing series Luck, and best-selling author Don Watson drew a rapt assembly of delegates to this afternoon’s plenary session, titled: ‘Connecting racing with popular culture’, at the 35th Asian Racing Conference, held at the Hong Kong Convention and Exhibition Centre. Panel member Don Watson presents his views in the session. Mr Barich, who rarely speaks in public, told the audience that “racing is a great democracy” in the way it brings people together from all walks of life. The American writer’s first book, Laughing in the Hills, has become a classic racetrack novel. Barich described how he immersed himself in racing’s sub-culture as he spent 10 weeks at an American racetrack, getting to know the characters, hearing their fascinating stories and making notes. “It’s the notion of a confined universe,” he said. “That’s what we tried to show with Luck. Their lives are absolutely enmeshed with the horse, with the circumstance of seeing the same people and having to deal with the same people on a day-to-day basis. Mr Watson, one of Australia’s most distinguished writers and public speakers and a recipient of the 2010 Philip Hodgins Memorial Medal for Australian Literature, spoke about his experiences as a fan of horseracing and as the owner over the years of around 30 low grade racehorses. “The attraction of racing is the horse,” he said. “We idolise great horses – I would not like to think how much of my childhood was spent thinking about Tulloch, the great Australian horse. I was probably in love with him most of my childhood. Chris Luoni and Gerald Fell, co-founders of the New Zealand Racing Hall of Fame, told how the project was formulated and the Hall of Fame established, with its first induction night held in 2006. The duo highlighted how the induction events share with a wider audience the fun and folklore of racing’s fascinating culture through the characters that enliven the sport. They also told how inductees’ stories, photos and video footage of past glories are shared online at www.racinghalloffame.co.nz, which has become the New Zealand breeding and racing industry’s on-line history cache and a vital educational tool.